It’s quiet simple really; as long as Tech exists, there must be construction on campus, preferably in the least convenient location possible. The current least convenient place for about half of campus and anyone craving food from Highland Bakery is the area around Tech Tower, which has resulted in the registrar being moved to the Savant Building. Readers, I urge you to remain calm; this writer investigated the real reason Tech Tower is so unnecessarily being renovated: aliens. Students have been suspicious for years about mysterious lights on campus and strange behavior of their peers; these sightings and behaviors often align with the most stressful times of the semester, an obviously uncorrelated fact. What else causes these symptoms? Alien sightings. The only logical place for these aliens to call home? Tech Tower. The so-called “renovation” of one of Tech’s most iconic buildings began in the Fall 2015 semester and is supposedly a thorough revamping the building’s heating, cooling, and electrical systems as well as a redo of the plumbing throughout the Tower. Anyone who’s been in any other building on campus knows that there are many other buildings that could use a revamp of facilities, piping and HVAC systems. 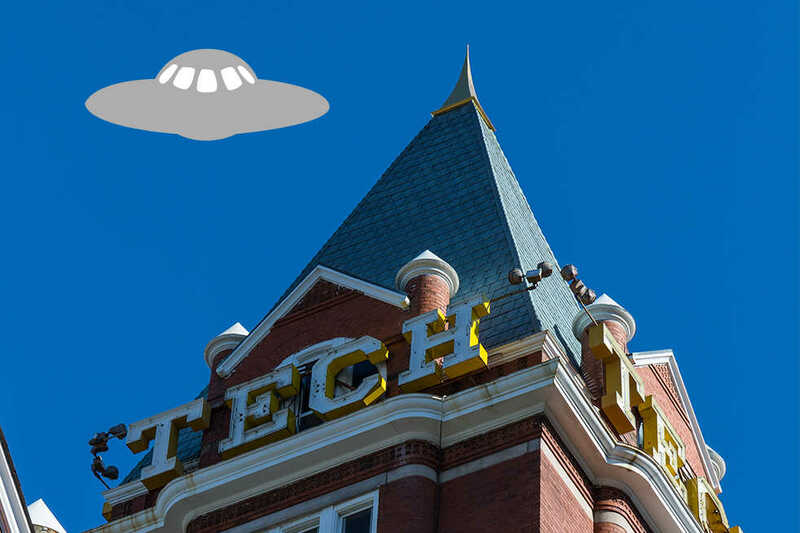 It can be safely assumed that these knowledgeable aliens have decided to return home after years of living at Tech, and that the Tech Tower we’re walking past today may be entirely different from the Tech Tower we knew until construction began. So until Tech Tower’s “renovations” are over, be sure to keep an eye on the sky; when you see a rocket shooting off into space, know its our friends from a different world returning home and be sure to adjust that tinfoil hat on your head. Disclaimer: This is part of our April Fool’s wraparound and is in no way factual.